Mr. Trombetti believes in conservative lending practices and instills rigorous underwriting guidelines which has facilitated an increase in SILC’s servicing portfolio every year since inception. It has since expanded from a local mortgage lender in Central Florida to a regional lending institution. This traditional philosophy also prevents potential borrowers from taking on projects that may pose risk for all parties involved. Nate has had tremendous success in all facets of the real estate market, from renovating single family homes, to entitling raw land for development. With 17 years of combined experience in real estate investing and residential non-owner occupied financing, Nate has also been a licensed real estate broker in Florida since 2000. 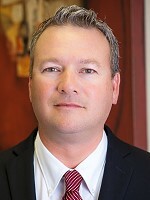 Prior to co-founding SILC, Mr. Trombetti was with a national oncolytic distributor after graduating from the University of Central Florida in 1995.